Retired U.S. Army Maj. Gen. Paul E. Vallely, right, met recently with Russian President Vladimir Putin’s top Mideast assistant, Mikhail L. Bogdanov, at the Russian Embassy in Paris. WASHINGTON – A retired U.S. general says he has obtained a Kremlin promise to meet with representatives of the Free Syrian Army to help resolve the Syrian conflict, according to a report in Joseph Farah’s G2 Bulletin. 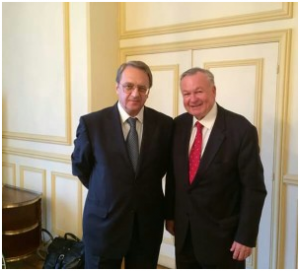 Retired U.S. Army Maj. Gen. Paul E. Vallely recently told G2Bulletin he met at the Russian Embassy in Paris with Mikhail L. Bogdanov, Putin’s special representative for the Middle East and Syria. Vallely said he told Bogdanov he could arrange for about 10 exiled Syrian army generals and Syrian diplomats comprising the leadership of the Free Syrian Army to meet with the Russians. The goal would be to halt the Russian bombing of their positions in Syria while joining forces with the Russians to defeat ISIS. Vallely, who served in the Vietnam War and was deputy commander of U.S. Pacific Command, has been in the forefront of getting U.S. arms to the FSA, including TOW anti-tank missiles. In his capacity as chairman of the non-profit Stand Up America, Vallely was accompanied at the meeting by his Mideast expert, Naji N. Najjar. Get the rest of this, and other, reports at Joseph Farah’s G2 Bulletin. Follow his meeting with Bogdanov, Russian Foreign Minister Sergei Lavrov announced that Moscow would be willing to meet with FSA representatives. Russian Foreign Ministry spokeswoman Maria Zakharova said that a meeting will take place soon at one of its embassies. There has been speculation that a meeting of FSA representatives could take place in Paris, Vienna or in Abu Dhabi, United Arab Emirates.